The first month of the academic year proceeded quite as we planned with renewed memories and lots of learning. It is indeed a feeling of happiness to see the new students accustom themselves to this atmosphere and the old students graduate into a higher class with positivity and smiles. At the outset, I would like to heartily welcome all the new students, teachers and parents who have joined our team this year. Our school website is a collection and documentation of all the events and happenings in our school throughout the academic year. We believe that parents need to have an access to the school whenever they wish to know what is happening rather than waiting for the PTM, and the school website is an active source. While the first month of the academic session included a lot of new learning, the second month included various testing techniques in the form of written and vocal. We conducted the first set of Formative Assessments in the month of July and soon after the exams we had also arranged for a parent teacher meeting. PTMs in Voxpop are taken very seriously as it is the biggest and the strongest platform for parent teacher communication. Your child’s growth and his learning curve can be discussed in every PTM and hence we insist all the parents to be present. Our young Voxpopians also took to protecting the nature and environment this month and vowed to protect it forever. All the students were encouraged to participate in the Swachh Bharat programme and clean the school premises and its surroundings. Environment week was celebrated in Voxpop wth sapling day, where students planted saplings and made it a point to water them each day. The students put in tremendous efforts to make placards and skits and rallies to help understand the importance of environment to their fellow classmates and juniors. As a part of environement week the students were taken to Botanical gardens and state forest and were given a trip round the place by the authorities . 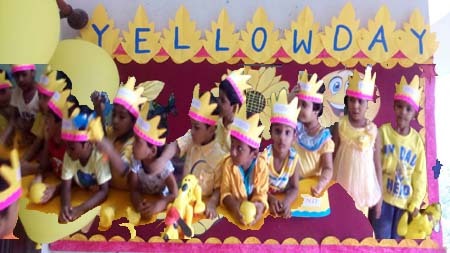 In the process of teaching our pre-primary students colours, we created the concept of yellow day, where the students, teachers and the rest of the management came dressed in yellow. We take good steps to teach our children and inculcate the right habits and we are thankful to all the parents for their support.